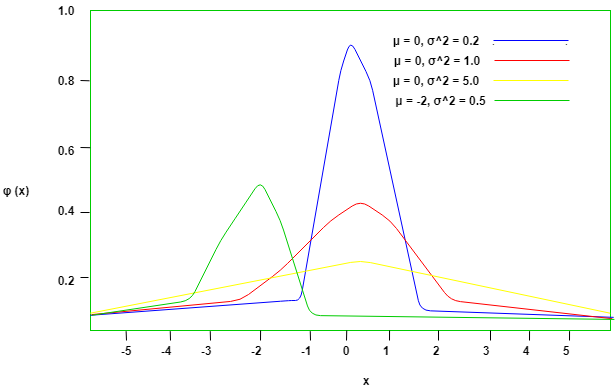 The previous two articles introduced two Continuous Distributions: Uniform and Exponential. This article covers the Normal Probability Distribution, also a Continuous distribution, which is by far the most widely used model for continuous measurement. Whenever a random experiment is replicated, the Random Variable that equals the average (or total) result over the replicates tends to have a normal distribution as the number of replicates becomes large. It is one of the cornerstones of probability theory and statistics, because of the role it plays in the Central Limit Theorem, and because many real-world phenomena involve random quantities that are approximately normal (e.g., errors in scientific measurement). It is also known by other names such as- Gaussian Distribution, Bell shaped Distribution. It can be observed from the above graph that the distribution is symmetric about its center, which is also the mean (0 in this case). This makes the probability of events at equal deviations from the mean, equally probable. The density is highly centered around the mean, which translates to lower probabilities for values away from the mean. In the above formula, all the symbols have their usual meanings, is the Standard Deviation and is the Mean. It is easy to get overwhelmed by the above formula while trying to understand everything in one glance, but we can try to break it down into smaller pieces so as to get an intuition as to what is going on. The exponent of in the above formula is the square of the z-score times . This is actually in accordance to the observations that we made above. Values away from the mean have a lower probability compared to the values near the mean. Values away from the mean will have a higher z-score and consequently a lower probability since the exponent is negative. The opposite is true for values closer to the mean. 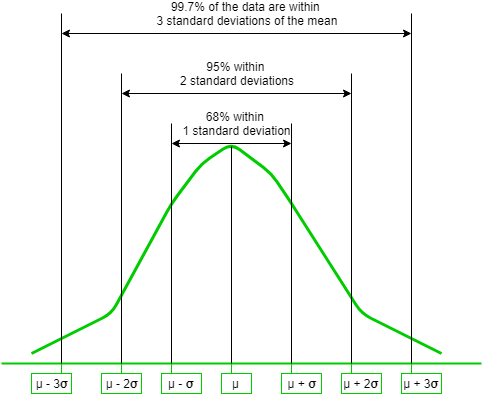 In the General Normal Distribution, if the Mean is set to 0 and the Standard Deviation is set to 1, then the corresponding distribution obtained is called the Standard Normal Distribution. The cumulative density function of normal distribution does not give a closed formula. Hence precomputed values formulated in tables are used where-ever required. But these tables only contain data for the standard distribution. 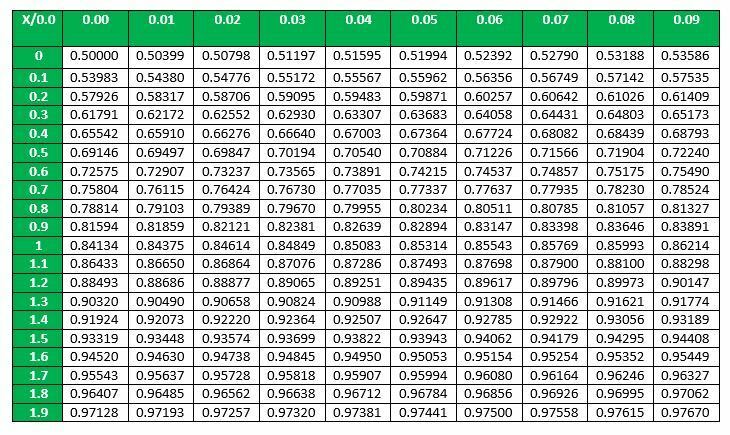 In order to find the cumulative probability for a general normal distribution, it is first standardized and then computed using the value tables. 1. First, there needs to be only one table to compute probabilities for all normal distributions. 2. Second, the table size is limited to 40 to 50 rows and 10 columns. This is due 68-95-99.7 rule explained above, which says that values within 3 standard deviations of the mean account for 99.7% probability. So beyond X=3 ( ) the probabilities are approximately 0.
the random variable  is a normal random variable with E(Z)=0 and V(Z)=1. That is, Z is a standard normal random variable. Example – Suppose that the current measurements in a strip of wire are assumed to follow a normal distribution with a mean of 10 milliamperes and a variance of four (milliamperes) . What is the probability that a measurement exceeds 13 milliamperes? 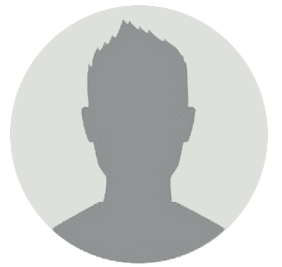 Solution – Let X denote the current in milliamperes. The requested probability can be represented as P (X > 13). Let Z = (X ? 10) 2. 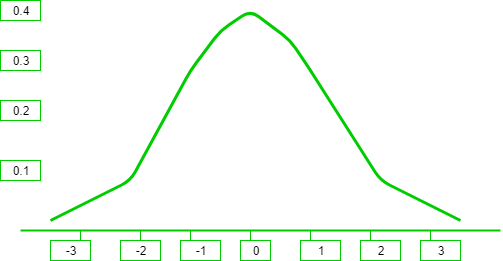 With the Normal Distribution now standardized, the probability P(X > 13) = P(Z > 1.5) can now be easily computed.